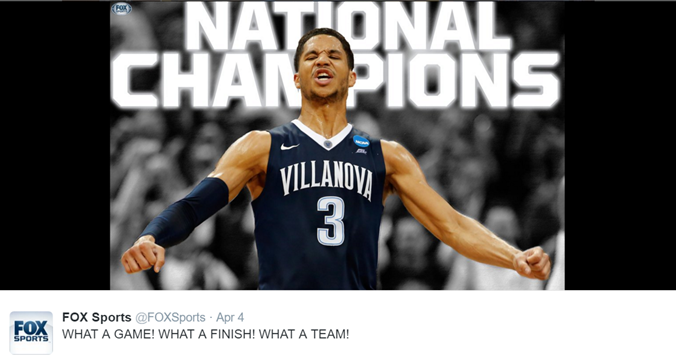 Congratulations, Villanova Wildcats! You just won a national championship and subsequently increased the number of applications you will receive for the foreseeable future. Originally an unintended consequence of athletic success, winning a national championship and a spike in applications is now deemed a causal relationship rather than one of mere coincidence. Research originally conducted by Douglass Chung on the affectionately dubbed Flutie Effect (from the 1986 Hail Mary pass thrown by Doug Flutie for Boston College against a formidable and what was thought to be unbeatable Miami team) has concluded that applications can soar following the securing of college’s highest athletic honor- earning a national championship – by some 18%. Still early in the research process, analysts are still trying to fully understand the rationale behind statistics that support this increase. But there is certainly speculation surrounding the why. A national championship provides a stage that is a marketer’s dream. It’s broad and quite literally prime time. To reach such an audience without shameless plugs or haughtiness, where a group of kids, many of whom have personal stories of overcoming near insurmountable odds, is a coveted opportunity now desired by those not only in the locker rooms and field houses but also in the esteemed gateway to the university, the admission office itself. This is branding at its finest. And let’s face it – everybody loves a winner. In our sports-obsessed culture, watching a team claw its way to the top, despite challenges and setbacks, is still a metaphor for the American dream. It’s about grit (a phenomenon now being scientifically studied; here’s a TED talk on it), hard work, resilience, and teamwork. And it’s about believing – up until the very end, when 0.0 remains on the clock – that there is still a modicum of a chance at victory. That is in fact how this year’s championship game played out when Kris Jenkins of Villanova released the ball for the game-winning shot with only .5 seconds remaining. By the time the ball cleared the nylon, time had run out. Who wouldn’t want to be a part of that sort of legacy? I’m betting a whole lot of college hopefuls will come next fall.